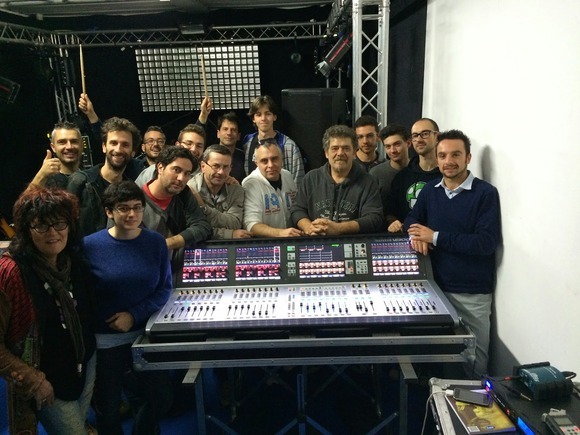 PERUGIA, Italy – The main audio integrator within its local region in Italy, Acoustic Light recently completed a successful acoustic training session featuring new audio products from HARMAN Professional. By using Soundcraft consoles, JBL loudspeakers, Crown amplifiers, AKG microphones, Lexicon digital effects processors and BSS signal processors, Acoustic Light showcased the latest digital audio technology for a variety of applications. Participants at the event included sound engineers, musicians, and other audio service providers. For the training session, Acoustic Light used a Soundcraft Vi3000 console with a Stagebox, a Soundcraft Si Expression 3 console with a Compact Stagebox and a Soundcraft MH3 console (48 channels) with an analog Stagebox. Also featured were JBL PRX715 and SRX700 loudspeakers, Crown I-Tech 4000 amplifiers, AKG C 414 LTD and C 451 B microphones, Lexicon PCM81 and PCM91 digital effects processors, and BSS AR-133 and FCS-960 signal processors. These products allowed Luthi to explain the basic concept of audio design to the musicians while showcasing advanced features for the engineers.